This is a recent kit that I put together just before I started my website. It was part of a few kits that were given to me as leaving presents from my old job. The sub itself built up very quickly and easily and I am very happy with the end result. The only problem that I had was thinking about a setting for it. I had toyed with a few ideas but none of them really appealed to me so unfortunately this became yet another kit in my stash waiting for inspiration to hit me. 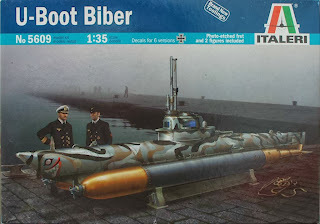 In the end the inspiration came from another modeler who had put together a different mini sub and displayed it as being dry docked with some tools and equipment around it with a mechanic and a dog. The idea was simple, effective and I am ashamed to say one that I am going to replicate as I have all of the kit parts to hand. The one thing that I didn't have was the base to start everything of on. For this I have purchased an excellent cobble mould from diorama debris, a company that I found on the internet that caters for all sorts of diorama materials and a company that I highly recommend. their website is HERE . With the base complete it will now be a case of fixing the sub and stand into position and then painting the various workshop detritus that will adorn and compliment the base. I will also modify a figure that I have to make him look like a mechanic of sorts that is about to feed a stray dog. The following shots are taken as each new piece is added to the scene. the majority of the pieces are from the spares box and I think are from Tamiya and Italeri, although some other manufacturers might have sneaked in. I Also decided to change the figure to a Navy officer in overalls looking down at the dog. The only problem that I had was that I did not actually have a navy officer in overalls in the figure spares box. I opted to use an old tamiya figure as the base for the figure. The trousers were made from milliput and the naval officer hat started life as a British officers hat that was filed and re-modelled using milliput. I am happy with the resulting figure as shown below. The final painting of the figure will be done just before he is mounted onto the base. For the dog I also decided to do a little extra work on him; one of the dogs legs was cut and re-positioned in a raised pose in order to depict the dog urinating over a tool kit that is placed on the floor in front of the sub. I also added some clear stretched sprue which I will colour with some clear orange paint to give the impression of urine on the floor and tool kit. I'm just as relieved as I am happy with the finished result of this vignette. Not only do I finally have a base and theme to display this wonderful little kit, but I have also used up some more accessories from the spares box. As I have previously said; the credit for the layout of this vignette must go to another modellor who originally came up with this concept to display a mini submarine and I think that my interpretation of his work will pass muster when compared to the original. I hope that you enjoy looking at this simple piece and finished photos will be added below once the oils used has dried sufficiently to allow a coat of matt varnish. Nice one Craig! The cobblestones look fantastic! And the dog taking a leak is a fine touch as well. I love the DIY cobblestones!